Universal City, California, December 1, 2014 - Prolific playwright Israel Horovitz makes his directorial debut with My Old Lady , a witty and heartfelt drama about surprising inheritances and unexpected connections that critics are calling "simply wonderful" (Jeffrey Lyons, Lyons Den Radio) and "a classic in the making" (Sydney Levine, Indiewire). 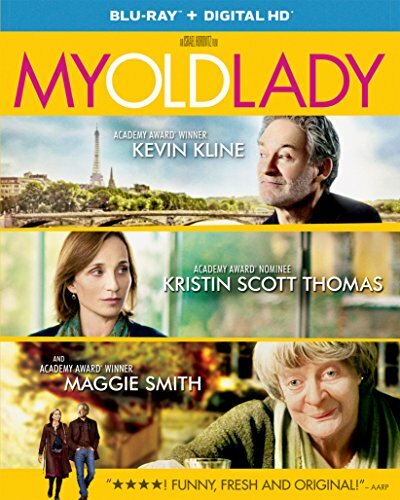 Following a successful theatrical release through Cohen Media Group, My Old Lady arrives on Blu-ray(TM) with Digital HD and Ultraviolet and on DVD on January 27, 2015 from Universal Pictures Home Entertainment. The film features an outstanding cast including Academy Award(R) winners Kevin Kline and Maggie Smith and Academy Award(R) nominee Kristin Scott Thomas and will also be available two weeks early on Digital HD January 13, 2015. When Mathias Gold (Kevin Kline) arrives at the sumptuous Parisian apartment he inherited from his father, he's surprised that the property comes with two stubborn live-in tenants who are not required to leave according to an ancient French real estate law. Unable to sell the place, Mathias moves in with the feisty Englishwoman Mathilde (Maggie Smith) and her daughter, Chloe (Kristin Scott Thomas). But as Mathias and Chloe draw increasingly closer, Mathilde unveils a complex labyrinth of secrets that unites the trio in unexpected ways. My Old Lady will be available on Blu-ray(TM) with DIGITAL HD and UltraViolet(TM) and DVD. Blu-ray(TM) unleashes the power of your HDTV and is the best way to watch movies at home, featuring 6X the picture resolution of DVD, exclusive extras and theater-quality surround sound. DVD offers the flexibility and convenience of playing movies in more places, both at home and away. DIGITAL HD with UltraViolet(TM) lets fans watch movies anywhere on their favorite devices. Users can instantly stream or download.